Everyone’s doing it. It’s the new, old thing. There’s Apple and Microsoft, Netflix and Amazon, there’s TiVo, Roku, Sony, Sezmi (formerly Building B), Vudu and more. They’re all bringing some form of video on-demand services over the Internet; rentals and purchases, some even free. It’s the promise of TV and movies as you like it, when you like it. Thursday, Amazon became the latest entry into the crowded market. Technically, though, it’s a re-entry. 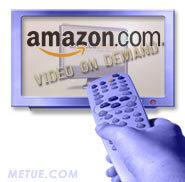 Since 2006, Amazon has offered a video on demand service called Unbox. Originally offered exclusively, and then in partnership with TiVo, that service required PCs (no Mac’s) and the use of a proprietary software download. It failed to garner a significant user-base. Amazon’s new Video on Demand service, which was rumored in May and has now launched in an invitation only beta, breaks some of the chains that held the initial Unbox service back. For starters, all of the programs will stream immediately through a viewer’s web browser. There is no proprietary software or downloaded “player” required. There is also no restriction on computing platform. The service will work for both PC and Mac owners. All of the programming available will offered a la carte at pricing tiers not yet disclosed. Reportedly, more than 40k titles will be available for instant access (Netflix “Watch Now” has about 10k titles, in contrast). The only major content producers not represented will be Disney (Disney, ABC, ESPN) and HBO. The marketplace Amazon is targeting is crowded and fractionalized at this point. Earlier this week, Netflix and Microsoft announced a tie up to bring Netflix service to Xbox Live. Microsoft also has content partnerships for direct offerings of their own (including exclusively developed Xbox 360 video programming). Sony, not to be outdone, launched a PS3 download store that will eventually be accessible to other connected Sony products. There is also Apple TV with iTunes integration, the BBC through the Wii, Netflix Watch Now (direct via the computer or through the TV via Roku) and a host of other challengers. Most of the services are offering some level of overlapping content. Lacking the luxury of exclusive programming, Amazon seems to be hoping a combination of their brand strength mixed with the simplicity of their offering will help give them an advantage. One of the new service’s selling points according to Amazon is the immediate delivery of the content (there is reportedly less buffering prior to the start then with other services) and its ease of use. Bridging the gap between the PC and TV has arguably been the biggest impediment to success for most Internet video offerings. Amazon hopes to crack that challenge by following a similar licensing approach to that being used by Netlfix with their “Watch Now” service. Amazon will offer their technology to consumer electronics makers for embedded placement in their products. The more who sign on, the more widespread access to the Amazon on-demand service will be (eventually even, maybe, leading the way to Amazon shopping from the TV). The first licensing deal has been struck with Sony. Sony Bravia TV owners will be able to access the store directly if the owners have bought the Sony Bravia Internet Video Link, a $300 accessory. Future Sony TV’s will have the technology directly embedded. For now, the new Video on Demand service will remain in an invitation only beta. An official public launch is slated for later this summer or early fall. For now, the old Unbox service will also remain available. In other streaming video news …. It’s official: not all movie companies are anti-Youtube. Major indie, Lions Gate, has cut a deal to offer ad supported clips of their movies and TV programs on the Google video site. Lions Gate, which counts 2005 Best Picture winner Crash and TV hits like Weeds among its catalog, will seed the content to a branded YouTube channel. Google says they are talking to other studios about similar partnerships. Terms of the Lions Gate deal weren’t disclosed.